Originally uploaded by beth elle. sorry. i have been so bad at blogging lately. i guess i started the blog to share stuff with my friends and family that i was missing while we were in italy. and now i am home and i am missing my buddies i met over there. and now everyone is strewn across the globe for the summer. so i should be telling all you guys whats going on with me back here in the usa. well its been nasty hot here in NJ. like yucksville. (except yesterday which was cool and lovely). i was also totally out of it this past week with sickies. despite my illness i went to phillie with beth and saw danny and cynde and met up with my aunt wendy. it was fun, but again it was so so gross-hot. but danny and cynde took us to some local spots in there little neighborhood of phillie, what’s it called? liberties, new liberties or north liberties, port liberty-wait is that in jersey city? i dont know. its a cute area thats becoming very arty, with galleries and studios and cafe’s. its in a transition, things being built all the time and new businesses popping up. they have great restaurants and a nice vibe around where they live. what else? i got to see my grandma. it was her 84th birthday and she still rocks. she is so hip in her happy bright colors and sparkling jewelry. i will get a picture of her and i from beth and put it up soon. my mom is coming home this weekend, i havent seen her in about a year, so we will celebrate her birthday this weekend. hott summer. chloe in the kiddie pool at sesame place. pattern sketch for new painting. 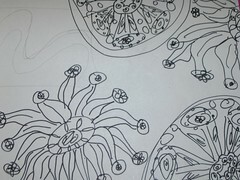 inspired by the drawings of ernst haeckel. today we celebrated my aunt wendy’s birthday with a bar-b-que pool party. Hey all. Check out this! to see more photos from my flickr page. pool party inflatable animal wars. all the gustafson kids in the pool together (plus chloe) @ wendy’s 50th bithday bash.